Download as PDF NEUHAUSEN, Switzerland—(February 5, 2018)—Tyco Retail Solutions today announced it has surpassed 63 billion consumer products source tagged to date, helping retailers protect more of what’s in store. 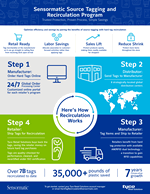 Setting a retail industry milestone with Sensormatic merchandise source tagging, the program has also achieved seven years of consecutive growth since 2011. 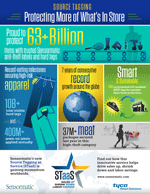 Tyco’s program is the largest in the industry, assisting the world’s top retailers to secure the most popular consumer and apparel items. Additionally, source tagging can help reduce shrink by standardizing product-level protection, while safeguarding virtually every product category. Download as PDF The company’s program encompasses source application of Electronic Article Surveillance (EAS) one-time use labels and reusable hard tags. Today, the majority of Sensormatic labels are applied by product manufacturers or packaging companies at the source instead of in stores. Sensormatic source tagging helps retailers drive sales as merchandise arrives “retail-ready" for immediate placement on the sales floor. The program also enables sales associates to focus on customers instead of the manual application of security tags in-store. For more information, check out additional cost-saving metrics and program milestones. Learn more about our Sensormatic source tagging and recirculation program.